A bathroom that features a manly design isn’t only appealing to the male side of the population, but it also has an edgy, bold vibe that certainly stands out. The key to giving your bathroom a masculine touch lies in relying on a mixture of materials, bold colours and a strong yet understated design. However, it’s also important that you find your own unique expression and style that will give your bathroom a unique flair. A manly bathroom design typically features a powerful yet understated colour scheme of balanced tones. Although such a design heavily relies on the black-and-white combination or different shades of grey, it still allows you to introduce pops of colour such as navy, red and green. For instance, a blue, moody accent wall can set the tone of relaxation and meditation while also working as a stunning statement. A monochromatic colour palette creates a harmonious, powerful atmosphere while also enabling texture and form to come to the forefront. You can even go with an all-black bathroom design for a wow effect or give your bathroom a more neutral look by mixing green and grey. For those who prefer subtler looks, a neutral, white backdrop is also a great option that will enable you to create a bold look by introducing masculine details. Not only is wood infinitely stylish, but it also works perfectly with a dark colour palette. Since a masculine design features an edgy look, wood is the perfect way to create a balance. It will introduce a feeling of warmth and cosiness to your space and give it a rustic touch. Nonetheless, it will still preserve that bold, manly appeal of such a daring design. A door made of salvaged wood can be used as a mesmerising focal point that will create a beautiful contrast against a bold backdrop. Dark wooden storage units can also be introduced in a manly bathroom. Not only will they create an organic ambience, but they will also introduce an enticing play of texture. Creating a visual balance is important in any design, especially a bold one such as masculine style. Focusing solely on dark tones and edgy shapes can create a somewhat overbearing look. On the other hand, introducing slightly gentler shapes can soften the look and let every element truly shine. For instance, chic modern bathtubs that feature a subtle design of soft, clean lines can be the perfect addition to masculine bathrooms. Their subtle design can be juxtaposed with bold, dark shades and geometric shapes, creating mesmerising appeal. In addition, introducing a beautiful white tub to your black manly bathroom can be a beautiful décor statement. 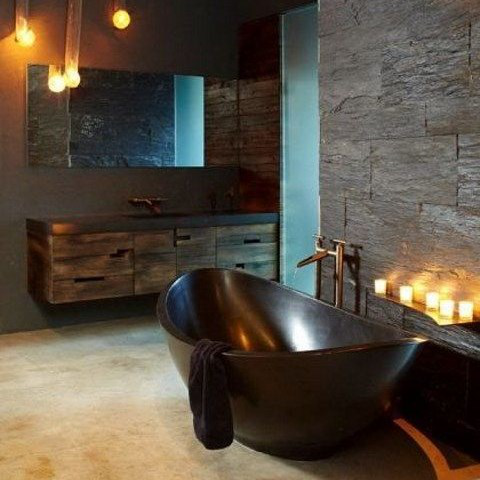 The industrial style exudes masculinity and edginess, which makes it perfect for a manly bathroom design. Focusing on a beautiful mixture of strong materials and bold industrial details, such a design will certainly create a stunning atmosphere in your bathroom. While concrete walls and/or floors will create an ambience of an old warehouse, exposed pipes and industrial fixtures will capture its spirit. For a unique look, you can opt for an exposed brick wall and create a surprising effect. The industrial style also embraces leather, so introducing a leather armchair in the corner of your manly bathroom can transform it into a true focal point. For the final touch, you should implement industrial lighting fixtures with a brass finish. Accessories can make or break your manly bathroom, so make sure to introduce the right ones. It’s always better to go with just a few hand-picked details that will create a stunning impression than cluttering your bathroom with unnecessary items. A simple metal ladder can be used as a towel rack, giving a minimalist yet unique flair to your bathroom. A shower curtain is also an important accessory in a bathroom. A simple, gender-neutral curtain design will create an understated, timeless look. When it comes to other decorative details, such as towel hooks, soap dishes, toothbrush holders and others, you can go with a simple design with a matte black finish. As already mentioned, you should find your own personal style and express it through design. This will give your bathroom authentic appeal that exudes personality. And there’s no better way to achieve this than using artwork. Works of art can be beautiful embellishments on your bathroom walls. For instance, abstract wall art that features geometric shapes can give your bathroom a manly flair. Of course, you can always introduce your favourite artwork as a way to give your bathroom your personal touch. Designing a manly bathroom is surprisingly simple and inspiring, allowing you to find your own sense of style and experiment with a bold design.